Are you looking for a ’38 Autocycle like the one that was shown on American Pickers? Click here to see a rare cantilever ’38 Autocycle. 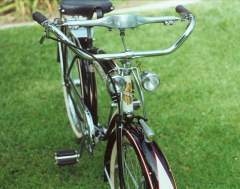 This is a 1938 Schwinn Autocycle that has undergone a complete restoration. First introduced in 1936 the Autocycle seriously revolutionized the balloon tire field in styling and sophistication. So much going on here that Schwinn incorporated the word AUTO into the title of these bikes. 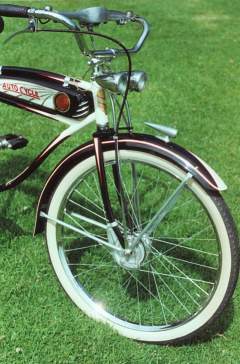 No other bike of the period had as many deluxe features and accessories as the Autocycle. This jewel tanked bicycle is 100% original parts, no aftermarket stuff at all. From the full floating “pogo” saddle right down to the deluxe speedometer crossbar. It has dual Seiss headlights, locking truss fork with original Yale Junior Arnold Schwinn & Co. key, Super nice WW Goodyear G-3 Tires and a meticulously restored Schwinn Speedo head. It also features the early Fore Brake and super rare early brake handle with the original cable. NOS Liberty headbadge and a Liberty decal on the downtube. First year for the feather chrome chainguard. These bikes were built like no others of the period and represent the pinacle of art deco design. 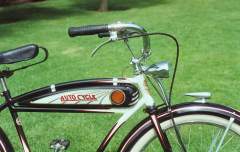 The late 30’s by all account produced the greatest American highly stylized bicycles ever made.